When I walked through Humboldt Park during the famous snowpocalypse of 2011, the drifts came up to my waist. When we all lived in nearby Ukrainian Village, two friends and I bundled up in several layers and stumbled through uncleared sidewalks and alleyways. Parked cars were buried in snow up to their rooftops. We crossed Western Ave and into the Humboldt Park neighborhood, usually electric with action and conversation. That day, it fell silent, as silent as the Park itself. Everyone was still inside, huddling beneath blankets and beside space heaters. In the Park, a lone figure trudged through the snow off in the horizon. We wandered through quiet, covered fields — in awe of the overwhelming whiteness, ice falling into our high boots, fingers frozen and balled inside our pockets. Last week, on an unexpectedly warm fall day, I walked through Humboldt Park again. I wore a short sleeved shirt. No socks. The sun beat down on the top of my head, fingers fell lazily at my sides, not balled up like they instinctively do in cold weather. It was me and a crowd of other west siders, strolling, sitting, fishing, bartering, and jamming with their dueling salsa bands, speaker volume turned all the way up. I’ll never get tired of the sights and sounds of people loving being outside. That day, as I walked through Humboldt Park, I fell in love over and over. With families watching the ducks float in the lagoon. With weekend warriors stringing up portable hammocks between the trees. With grillers, runners, strollers, and salsa dancers, shoes off, feet twirling in flattened crabgrass. And all around us, the angled sun pierced through gaps in the turning leaves, tinting the crowd in swatches of orange and warm yellow. In fall, as in summer, the pace can be frantic, there’s an impulse to take advantage of the weather “while it’s still nice.” And it can all feel very rushed, if we let it. We push ourselves to go outside so at the end of the season we can say, I was there, and I didn’t let it pass me by. But pressure and pleasure make bad bedfellows. I’ve realized the secret to enjoying fall is in refusing to take heed of the clock. It’s in recognizing each day for what it brings, releasing expectations on ourselves and on the world around us. The secret is in loving each leaf when it’s there, and accepting when its time to fall has come. So on the warm fall day when I walked through Humboldt Park, I didn’t think once about the chill I felt in my bones during my snowpocalypse wander five years before. I didn’t dread the inevitable day when the trees would all lose their color, when the lagoon would freeze over, and the sky would turn soft and gray. I didn’t preemptively mourn the retreat of the autumn revelers, imagining the pull of itchy wool against their arms and the track of salted footsteps up their wooden front stairs. I just watched, and walked, and enjoyed the day for what it was. Humboldt Park is a gorgeous 200 acre park on the near west side of Chicago. It holds a nature sanctuary and bird/butterfly habitat, as well as many areas for protected native prairie plants. This isn’t generally a park to visit if you don’t want to interact with other people, but I think that’s part of its beauty. Come here to people watch, to joke with the fishermen, to help a wayward toddler back onto the trail, to gobble down a picnic of jibaritos that you bought down the street, and to enjoy the sights and sounds of a well-loved public park. Humboldt Park is easily accessed via public transit: the #72 North bus, #52 Kedzie/California bus, and #70 Division bus all drive right by. Back on Labor Day, surrounded by all that loud, vivid green, I was almost able to drown out the “last day of summer” whispers. Summer was alive and present. The sun was still out. The day was hot and muggy and the cicadas were screaming. People still strolled sleeveless, sockless. As we wandered through deep woods, the first step on our journey back to the city, I saw it on the edge of a row of bright green oaks and alders. Fall. It was a little spindly thing with lime-veined pink vellum for leaves. It grabbed the early evening light, and radiated a nostalgic warmth. It stuck out, a lone blast of color and crunch against a soft green backdrop. I wondered about this little tree. About the accelerated calendar it must have been using. About the singular forces that made it begin to turn so much earlier than the others. I kept walking, leaving fall behind, thinking it was an anomaly of the far northern suburb we had ventured into, something to deal with later. I reentered the city, blindly expecting summer to blaze on. But, sitting in my living room staring out at the treetops I’d grown so used to these past few months, I saw it again. Fall. I noticed the leaves of the honey locust across the street. A canopy of the brightest, boldest green whose uppermost leaves had now begun to yellow. Its bits of confetti gently released their hold on the branch, almost indiscernible for those not paying attention. And I realized, I hadn’t been paying attention. For all the walking and wandering and gazing and thoughtful considering I’d been doing this summer, my eyes had been closed. I saw what I wanted to and ignored what I didn’t. I’d quietly trained myself to take in the good, the green, the growing — and avoid the signs of change and transition. The fading color, the curling edges, the going-to-seed. Summer is on its way out, and fall is humming its arrival. Change is something I’ve never been good at accepting. I resist it, averting my eyes and ignoring the inevitable. I crave stability but rarely attain it. Out of control, hovering just shy of the unknown, the anticipation of the changes to come tighten in my stomach. Don’t think of it as the end of summer, think of it as a season of new beginnings. It’s a lofty task for someone who generally resists change by any means necessary. But in the spirit of new beginnings, I’ve started to look for signs of fall like I do with spring, spotting and uncovering the hints the living world has left around me. It’s still a slow shift — a flutter of yellow, pointed tips turning red, crisp brown wedged within curb — but I see it now, everywhere. I don’t avert my eyes. I don’t avoid the signs. The exact shape and color and sound and smell of it is still unknown, but fall is coming. It’s ok to not know exactly what’s on the other side of all this change. And I’m working hard to welcome it. A new park recently opened on the far north side of Chicago. Park #568 lies in a previously unused corner of Rosehill Cemetery. They claim no bodies have ever been buried here, though from certain corners of the site, you can see straight through the chain link fence toward the westernmost headstones. There’s a strange feeling in the air. Felled trees criss-cross throughout the park, some half buried in the central fishing pond, strangled limbs reaching upward from a watery grave. A few boardwalks snake through newly planted prairie grasses. The native woodland trees stand tall and thin, shooting fifty, sixty feet into the air before multiplying and dividing into thousands of tiny twigs. Most woody plantings have already lost their leaves — the forest floor, a multicolored carpet of maroons and purples, decomposing crab apples, and cleverly disguised wildlife. We spot a Giant Walkingstick, thin and brown, legs tipped in lime green. Body bouncing as he takes uncertain steps, slowly approaching the asphalt path. There are dozens of signs scattered throughout the park asking visitors to stay on the trails, but many don’t. Or can’t. The adults are generally respectful. Though I imagine asking rambunctious kids to walk quietly along the walkway, observing nature from a safe distance, is a crazy request. Deep woods are where secrets are shared, and inside jokes are born, and the best swords are fashioned out of dead branches. Even for me, the pull to abandon the path is strong. There’s a certain quality of light and shadow you can only experience when you’re surrounded by trees. 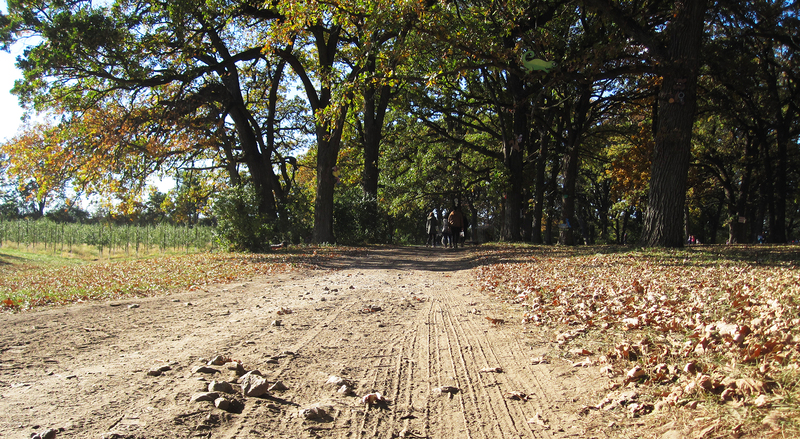 You can’t hear that familiar cottony squish of leaves and mud when there’s only paved clearing underfoot. But we stick to the trail. And listen to mothers share news of their most successful nieces. Wander alongside families eating identical PB&Js and miniature explorers hunting wild mushrooms. Watch through the fencing as 49B buses and pickup trucks hurtle down busy Western Avenue, windshields glittering as brightly as ripples on the pond. Park #568 is located near the intersection of Western and Ardmore, one block south of Peterson Ave. The park is free to the public and open from dawn till dusk. I recently went apple picking for the first time in my life. Four friends and I met up for an early city brunch and then ventured an hour away to Sturtevant, Wisconsin. We sang along to our playlist as the highway took us past corporate campuses and cropland. At our destination, we gorged on donuts and sipped hot, tart, spiced cider while a man wearing a dreamcatcher played Abba on pan pipes. The petting zoos and pig races and corn mazes were all swollen with people drunk on fall. We caught a hayride deep into the orchard. I’m clearly not a veteran, but I think the magic of apple picking might lie in the fantasy that everything you see belongs to you. Even if just for a moment. We wandered up and down endless rows of dwarf trees. All ours. The entrance fee bought us the freedom to taste as many pieces of fruit as we wanted. Dozens of varietals growing on dozens of acres — flashes of red and yellow called to us from behind giant patches of green. The fields were quiet and calm. You could hear the crunch of a newly bitten Jonathan or Cortland from beyond the treetops, the sound jumping from row to row. We wandered deeper into the property and found our way to the Enchanted Forest, a wild recess from the geometric farm park. The perfectly planted grove gave way to thick backwoods where dappled sunlight squeezed through tiny openings in the canopy. We walked slowly, eyes craning up and around, leaves crunching underfoot. Eventually the forest receded, the sky widened, and we were back in the farm. We got serious about filling our half peck bags with as many apples as we could grab, searching for the most perfect specimens and standing on tippy toes to collect them. The light began to lean lower as we wandered back through the orchard, past the dusty pumpkin patch, and back toward the entrance gates. The sound of pan pipes returned. As did the sounds of teenage yelps and car engines and cash registers. The transition back from nature to civilization is always an awkward one. Even a man-made apple orchard can deliver the feeling of escape that an urbanite craves after one too many cramped subway rides. For a few hours that Saturday, we disappeared. We climbed and stretched and tasted fruit fresh from the tree. We heard new sounds. We heard fewer sounds. We shared stories and laughed. We were quiet. We looked closely. We took a break from worry. We breathed. 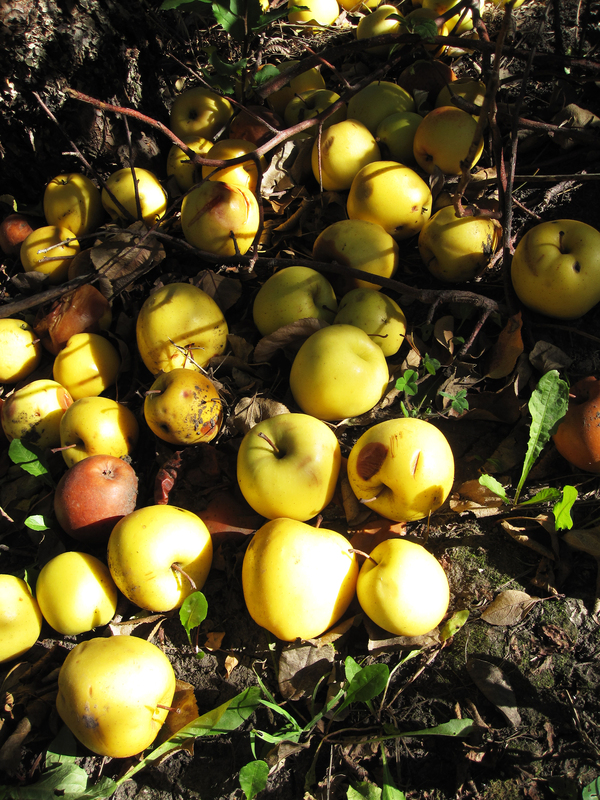 And for the next week, we ate delicious apples that reminded us of our fall day in Wisconsin. 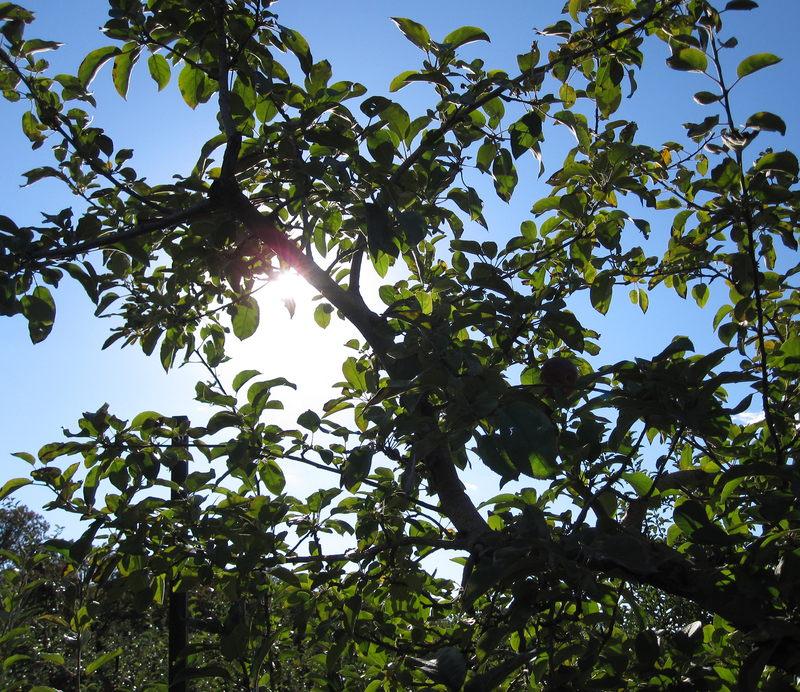 Apple Holler is located halfway between Chicago and Milwaukee at 5006 S. Sylvania Avenue in Sturtevant, Wisconsin. 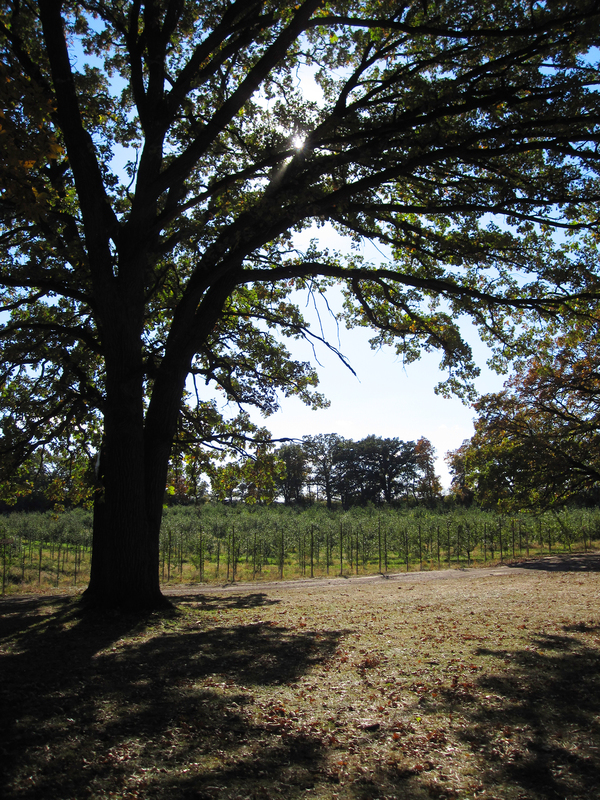 The orchard is open everyday from 9am-5pm. My eyes are constantly scanning the streets, staring deeply at every tree. Trying to memorize them exactly as they are during this time of year. Fall is fleeting in Chicago. I imagine many people feel this way in climate zones similar to mine. Every day looks different. We don’t get the thick, rich patchwork of New England color. Or Colorado’s yellow Aspen explosion. But fall still comes here. Trees that stood proud and green for months — bold and persistent in their aliveness — suddenly burst into plum, gold, rust. And the next day, the leaves are gone, the trees’ newly bared limbs reaching, silhouetted against a sharp sky. The city is bare again. You can see the siding and the concrete and the power lines and all the crumbling infrastructure that’s been camouflaged since May. As spring is a season of awakening, fall is the season of retreat. Both periods of transition, but in fall, the movement is toward silence, sparseness, rest. Some like to say it’s the time for turning inward. For plant lovers, it’s a bit of a sad goodbye. But of course, fall is unmistakably beautiful. Trees turn, in as many different ways as there are trees. Some glow from the crown downward, seemingly warmed by months of strong summer sun. Others begin to yellow from underneath, glittering only for those who remember to look up. A few trees become color; their neon leaves forming a giant mass of a single hue. Throughout Chicago, the colors are a random confetti. Leaf edges burn, the color bleeding inward until the entire thing flashes red. And then falls. The young oak outside of my living room window crisped up around August and went straight from green to ashy brown. The color drained long ago, but even now the leaves are holding on. Shivering in the wind. Just like me. This is the time of year when the trees outsmart us. These beautiful giants, usually so slow to change, can’t keep still. Leaves fly and fall and crunch. Shadows stretch. The sun sets. It all feels so quick, and one day you look up and it’s suddenly winter. But not yet. For now, at least for a little while, we still have color.